Tips for Choosing a Business Credit CardEliminate The Muda! If you own a business, big or small, you know one thing to be true: there are expenses that come up from time to time. This is true no matter what industry you are involved in. Although cash is king, there will be times when using a business credit card makes the most sense. Of course, you cannot do this until you have the plastic in your wallet. 1. Start with the financial institution with which you have your business checking account. Since you already have a relationship with them, applying for a credit card is a much easier task. Not only do they know you and your business, but they are more likely to accept your application and give you a great deal because you have been a reliable customer. Tip: You will have to get in touch with the “business development manager” or another person in the business department. Speaking with a bank teller about business credit cards is not going to get you very far. 2. There are many options, so do not sell yourself short. It makes sense to first contact the bank that you are most familiar with. But of course, they are not the end-all. There are hundreds upon hundreds of banks that are willing to work with you no matter what type of financial product you are looking for. An established relationship can help in many ways, but it is far from necessary. Although I ended up with a business credit card from my primary bank, I spoke with at least three others about what they could do for me. At the very least, consider all your options. This way, you can be 100 percent confident in your decision. 3. What are you going to purchase with your business credit card? The answer to this question will greatly determine what type of card you end up with. For instance, some business owners only need a credit card to purchase office supplies and other miscellaneous items. On the other hand, there are companies that will put tens of thousands of dollars on their card month after month thanks for equipment purchases, travel, and much more. If you don’t plan on using your business credit card often, you can afford to be more flexible with the terms. The answer to this question will also determine what kind of perks you should go for in your credit card. For example, get an airline credit card if you’ll be spending a bunch on travel. 4. What is the APR? Obviously, this is one of the first details that you want to consider when searching and applying for a business credit card. As the process unfolded, I learned a lot about this detail. For one, it seemed as if every bank had a different way of approaching the APR. Some offered a fixed rate, while others pushed cards with a variable rate. This may not be the only detail to consider, but a lower rate is almost always better than a higher one. One thing that I found interesting was that most banks offered two types of business credit cards: one with a rewards program and one without. With the majority of them, the APR was higher on reward cards. You have to weigh the pros and cons of a lower rate against having access to a reward program. On this same note, you also need to decide if you will be paying your credit card off in full every month or if the card’s interest rate will play a big role in your payments. Really though, I strongly suggest not getting a credit card unless you know you can pay it off in full. Don’t use it as a means to rack up debt. 5. Credit limit. A business credit card is only helpful if it offers enough available credit. How much you qualify for depends on many details, including your businesses credit score as well as your revenue. Most banks requested a copy of my last two business tax returns to verify income. Make sure you have these ready before you ever start looking for a credit card. On the surface, all business credit cards may appear to be the same. But once you get into the review and selection process you will find that this is far from the truth. Be diligent during the process of choosing your credit card and you’ll reap the benefits over the long term. Do you have any additional tips on choosing and applying for a business credit card? These are some pretty simple but VERY important things to consider. Especially about the first one-why not take advantage of a relationship and trust that you’ve already developed. Great post and with barriers to available credit falling this is the kind of thing new and established businesses should be thinking about. 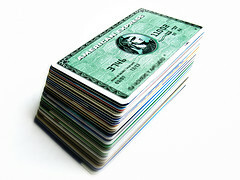 Choosing a company credit card with a low interest rate is very important. It also helps to not over spend on a company card. Keeping a low bill is very important for new just in case a very big business expense comes up. Owning a credit card can be very important. Although secondary to the considerations you mention above (like APR, limits, etc), I also would strongly consider a card with a good rewards program. Not just for you, but your employees will appreciate it too (provided some of them have expense accounts 🙂 ). Thanks for sharing those tips Andres! Applying for a business credit card can be an overwhelming task, as you mentioned there are so many companies offering this service, but with a little bit of research, business owners can find the best service overall.